Brown Premium Naked Leather Motorcycle Vest, is made of Genuine Leather, it’s a light weight fitted Leather vest for a sleek, Stylish, hot and polished look. 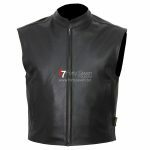 Leather Vest features four Front Snap button, Leather Lace-up, Slip hand pockets, interior pockets and comes fully lined. Has inner dual 3 pocket patches and 4 front pockets for ultimate storage possibilities, 10 pockets in total on this vest. Heavy snaps and Original YKK zippers.